Tuesday was a terrible day for shady diets in America. The commission is also pitching a new practice to enlist media companies to help weed out fake diets by refusing their advertising dollars. I don't know how effective that tactic will be in the long run, has the commission looked at the media industry's shrinking budgets lately? But apparently it is already working. The commission has seen “a significant reduction in the number of ads appearing” in major media outlets that screen advertising content before use, said Richard Cleland, an F.T.C. lawyer. In 2014 alone, consumers are projected to spend $66 billion on dieting products and memberships. And with that kind of money flying around there is bound to be some fraudulence, 13 percent to be exact in 2011. Under fantastically named investigations like “Operation Failed Resolution," “Operation Big Fat Lie" and “Operation Waistline,” the FTC has been targeting suspected swindlers to keep overweight Americans safe for years, so today's victory is just the latest in the fight. Elsewhere, actress Octavia Spencer filed suit against Sensa last summer claiming the company still owes her $700,000 of her $1.25 million contract. 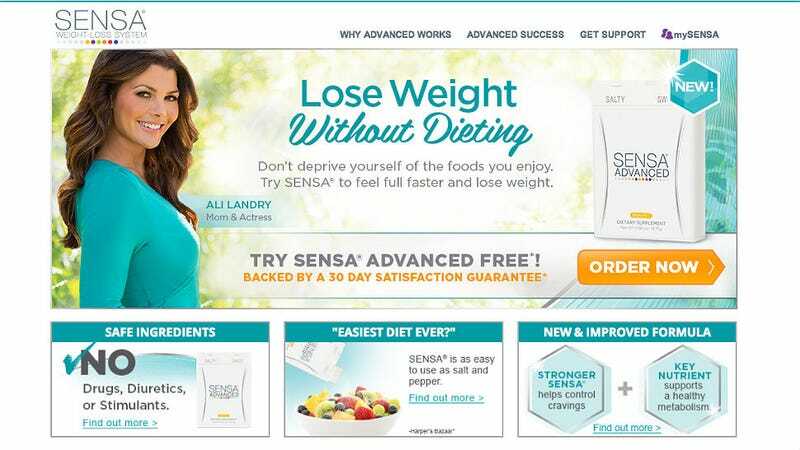 The rub is, she was clear while pitching the company's powdery product that she was a paid spokesperson, among other things — but Sensa isn't fond of transparency. Remember that crazy looking "photo" of Millionaire Matchmaker's Patti Stanger? In fact, the FTC reprimanded Sensa for failing to disclose that doctors and customers who also promoted the product in advertisements were paid spokespeople. A decision was expected in December from a Los Angeles court in the Spencer v. Sensa case, however any official news has yet to be reported.